Mumbai: Third seed Sachia Vickery of the US and former Wimbledon runner-up Sabine Lisicki of Germany made early exits after being beaten in the first round of the USD 125,000 L&T Mumbai Open tennis tournament on Tuesday. Vickery, ranked 96 but playing her first match in nearly two months, was retired when trailing against rival Deniz Khazaniuk of Israel, ranked 252nd, 1-5 in the third set, after winning the opening set 6-2 and then losing steam to lose the second 5-7. Later, 2013 losing Wimbledon women's singles finalist Lisicki, ranked 225 and a wild card recipient, blew hot and cold on her serves and ground strokes and also lost in three sets against Japanese opponent Nao Hibino, the eighth seed with a ranking of 125. Last year's losing finalist Dalila Jakupovic of Slovenia, seeded number 2 with a ranking of 73, made it to the round of 16 with a clinically efficient 6-4 6-1 victory in one hour and 16 minutes over Russias Veronika Kodermetova, ranked 116. Lisicki, who had made the semifinals as a wild card in the 2011 at Wimbledon and also made it twice to the quarter finals in 2012 and 2014 before injuries tripped her progress, started her match against the fleet-footed Hibino on the wrong note by dropping her opening service game in which she served two double faults. 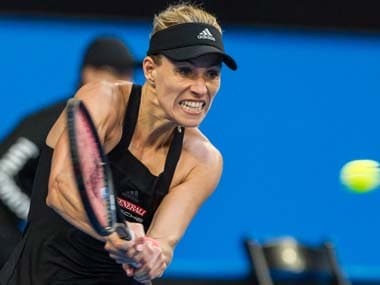 But the German, who served a total of eight double faults and six aces, recovered well to break back in the fourth game and broke her Japanese rival again in the eighth to clinch the first set. But, thereafter, she was put under a lot of pressure by Hibino who returned well and hit deep. Lisicki's serve was broken in the 8th game as she trailed 3-5. Despite saving a point and then holding one break point, the German was unable to stop the Japanese woman from taking the set on the third set-point and make it set-all. The momentum having shifted towards the Japanese, it needed some improved show by the German who again played a loose opening game and dropped serve. Lisicki then had a chance to break back in the 8th game but Hibino managed to stave off the threat and held seve after saving two break points. And finally it was curtains for the 29-year-old German when she netted a return on match-point and bowed out. Earlier in the day Vickery, ranked 11th in the US, was unable to bear the heat and humidity as well as the pressure from her Israeli opponent Khazanium and made her exit. 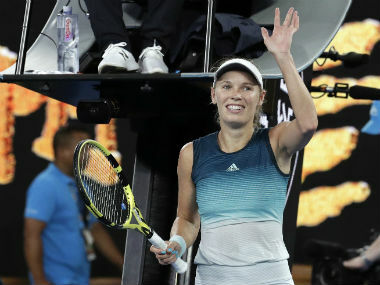 Vickery, 23, from Miami, Florida, said that this was the first match she had played after being sidelined for nearly two months following a tear in the knee. Singles (1st round): Deniz Khazaniuk (ISR) bt Sachia Vickery (USA) 6-2, 7-5, 5-1 (retd); Dalila Jakupovic (SLO) bt Veronika Kudermetov (RUS) 6-4, 6-1; Bibiane Schoofs (NED) bt Jana Fett (CRO) 6-3, 6-2; Jia-jang Lu (CHN) bt Ivana Jorvic (SRB) 5-7, 6-1, 6-1; Sabina Sharipova (UZB) bt Misaki Doi (JPN) 6-1, 7-6; Valentini Grammatikopoulu (GRE) bt Kwan Yau NG (HKG) 6-0, 6-2; 8-Nao Hibino (JPN) bt Sabine Lisicki (GER) 3-6, 6-3, 6-4; Ekaterine Gorgodze (GEO) bt Sofia Shapatava (GEO) 6-2, 6-4; Barbora Stefkova (CZE) bt Tereza Martincova (CZE) 6-4, 6-4; Irina Khromacheva (RUS) bt Hiroka Kuwata (JPN) 6-1, 6-4.